In Manchester, Connecticut Big Y Foods, a chain of 61 supermarkets is phasing out the do-it-yourself grocery shopping check out aisles. What was supposed to revolutionize and speed up a trip to the grocery store seems to falling by the wayside in a trade for the human cashiers. In fact, market studies have shown shoppers do prefer the personal contact. When the idea was first conceived, store owners had already been anticipating less overhead; surely many of the cashiers were going to be replaced by self-check-out scanners. After all, the self-check-outs are quite popular in Kmart, Home Depot, and Walmart. 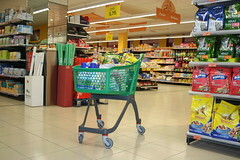 Supermarkets however seem to be different. For instance, if a shopper buys tomatoes, potatoes, wine, and bread, can a scanner get the customer checked out quicker than a cashier? Having tried it myself at a supermarket there was a bit of confusion. The scanner stopped at the wine purchase to ascertain if I was old enough, the scanner wouldn’t honor my coupons, and a mix-up on the type of tomatoes I purchased scanned the wrong price. A store manager rushed over and helped me, but that experience cost me time, and from then on I have preferred the live models. I also can’t forget the attachment, we as humans possess for the personal touch. Here in South Florida, Publix’ customer service includes someone always willing to help customers load their groceries into their cars. Even if it’s raining – a customer can use a huge green and white umbrella to get you to your car and then pull around to the front entrance and without even getting wet, someone has been waiting to pack up your trunk. Self-service-checkout lines undoubtedly have a lot to do with demographics. Younger consumers have grown up with self-service lines, but that doesn’t mean they aren’t expecting superior customer service. As the trend forges ahead to using bar code readings on our Smartphones, another phase of innovation – hopefully the personal touch will still move the grocery lines along quicker and more efficiently. I am disappointed by the removal of self check out lanes. I will intentionally go to a store that has them because I prefer to get what I need and get out. I’d much prefer a store use those wages on personnel on the floor and in the ailes helping me when I need to find a product.